The amazing colors of Plandon Cay Cut. 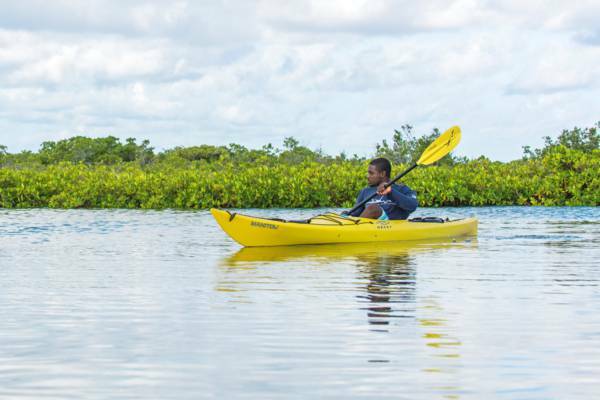 South Caicos is an amazing place for kayaking, but due to the lack of organized tours, the longs distances and the sometimes complex wetland navigation, the location is better suited for experienced paddlers. Kayaking with Big Blue Unlimited in the mangrove wetlands. For the experienced kayaker, South Caicos is an amazing destination. 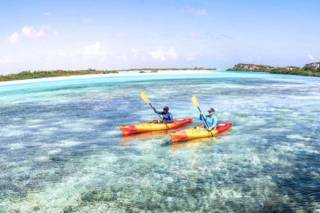 Countless small cays and tidal creeks are found to the north of South Caicos and the channels between these islands offer some of the best paddling in the region. 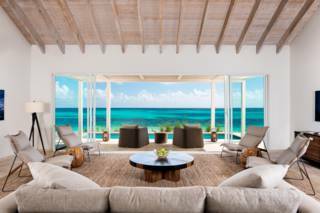 The foremost of these is the narrow channel between McCartney Cay and East Caicos, where sand bars and narrow mangrove-lined waterways paint truly unmatched vistas. Bell Sound National Park, a sheltered lagoon largely surrounded by South Caicos, matches the amazing turquoise hues of Chalk Sound on Providenciales and Bottle Creek Lagoon on North Caicos. Wildlife abounds in the sounds, creeks and wetlands near South Caicos, to a degree not seen elsewhere in the country. Southern brown stingrays, green turtles and small lemon sharks are common in the mangrove channels. The Cays and Channels north of South Caicos. Coastal birds, including frigatebirds, pelicans, egrets, herons and more, thrive in many locations. The density of ospreys at certain locations in the cays is also the highest in the country. Frigatebirds aren’t very common in the Turks and Caicos, only being established on a few mangrove islands in the eastern Caicos Islands, yet they are regular sights circling above the northern wetland channels. The marine environment isn’t the only interesting sights. There’s even a shipwreck of a yacht and old plantation ruins in the region to explore. 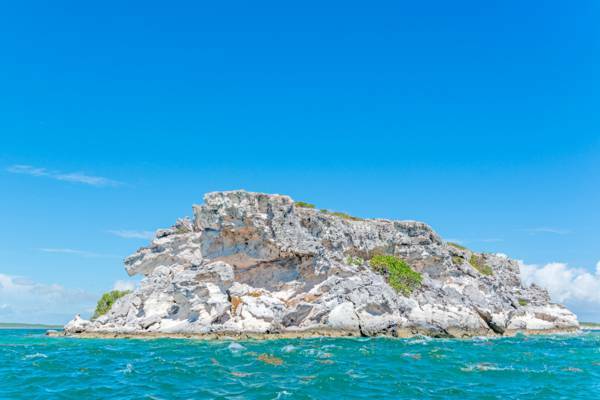 For the proficient paddler, the south-eastern coast of East Caicos can be reached within a day from South Caicos, and offers the finest kayak camping excursion in the Turks and Caicos. Kayaking at the sheltered waters of Bell Sound. 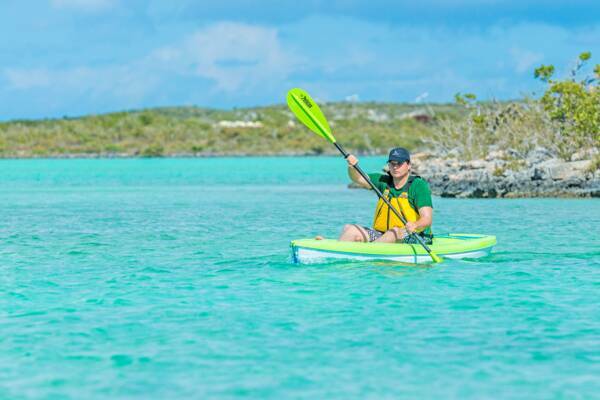 Due to the limited tourism to South Caicos, casual kayaking options are limited. All of the interesting sites tend to be relatively remote, so proper planning and preparation is necessary. Based on Providenciales, Big Blue Collective is the go-to business for adventure kayaking and stand up paddle boarding in the Caicos Islands. They currently maintain a decent selection of kayaks on South Caicos and offer rentals and guided tours. They’re also an excellent source of advice on current weather conditions and navigation. The luxury East Bay Resort has several kayaks and sailing kayaks for guest use. Consider the wind. Depending on conditions, it can be difficult to fight your way upwind. Starting your journey by heading into the wind allows your return trip to be much easier. Be aware of currents. 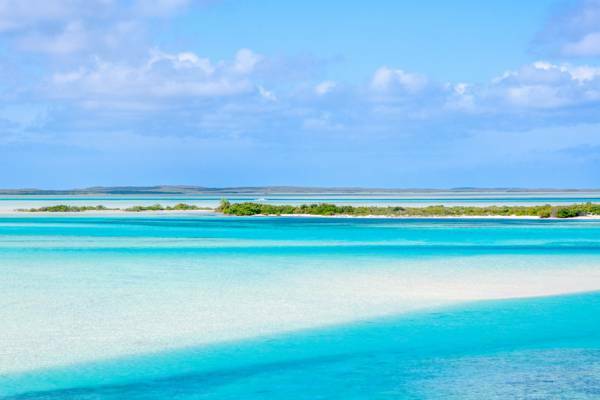 There are countless channels and bottle necks between the cays and small mangrove islands north of South Caicos. During the natural rise and fall of the tides, there can be significant waster movement in these areas. Although these currents really don't pose much of an actual danger, you can avoid unnecessary fatigue by paying attention to your surroundings. Take plenty of water with you. The sun in the Turks and Caicos can be intense, so avoid dehydration by drinking plenty of water (about a gallon per person per day when in the sun). Be sure to bring more than you expect to use in case you run into difficulties. Don't get lost. The wetlands to the north of South Caicos have vast areas of maze-like mangrove networks. We recommend that you familiarize yourself with the area by examining maps and also take a suitable GPS unit or go with a guide knowledgeable about the area. Always wear a personal floatation device. Accidents happen and weather changes. It simply makes sense to have and wear an appropriate life vest. The south point of Middle Creek Cay. Channel mouths such as this site can have significant water movement, as the irregular water surface can attest to. Sailrock Resort guests and those visiting on a day trip package have complimentary access to many non-powered water sports options, including kayaks, paddle boards, and Hobie Cat sailboats. Although still largely unrecognized as a tourism destination, the pristine and remote wetlands north of South Caicos offer some of the finest paddling in the country. Take one of our guided kayak adventures and witness the natural beauty that very few see. Last reviewed by an editor on 25 January 2019.